But when he went to the Senate floor Tuesday to deliver an emotional speech with a powerful punch, he had a more pointed message. The Republican-controlled Congress is in a tailspin of unproductivity, and that’s even before the Senate GOP’s failure last week to pass a long-promised repeal of the Affordable Care Act. By almost every objective measure — especially compared with 2009, the last time one party had control of the White House and both congressional chambers — it is off to a dismal start. Not only have lawmakers been unable to notch major accomplishments on health care or tax reform, but there are also fewer votes, fewer nominees confirmed, and fewer bills passed, according to a Globe review of congressional records of previous eras when the same party controlled the House, Senate, and White House. Today’s members of Congress are generally just not as active as their predecessors, according to another key measure. Through June, there were 9,247 pages of proceedings, which are the recordings of the daily business of Congress. That was almost 40 percent less than it was in 2009 and lower than any comparable period in recent history. “This is a historically unsuccessful moment for united government,” said Julian Zelizer, a history professor at Princeton and author of several books on Congress and presidents who enjoyed one-party governance. George W. Bush had an extraordinarily narrow majority of fellow Republicans when he first entered office in 2001, but still passed several signature laws. Bill Clinton had divisions within the Democratic Party when he took office in 1993, but he was able to push through a deficit-reduction budget. Congress has grown used to being unproductive. After all, the Congress that concluded in 2014 was one of the least productive in recent history. But this year was supposed to be different. President Trump ran as someone who could change the culture of Washington and use his deal-making swagger to get things done. Republicans seized control of all levers of power in Washington, giving the party the rare ability to control the agenda, and either ram through its priorities with party line votes or strategically pick off some vulnerable Democrats. The work of this Congress looks more like it has in recent years, when Republicans fought with President Barack Obama, rather than a Congress that has no roadblocks to accomplishments other than its own intraparty fights. The most recent previous instances of unified control were in 2001, when Republicans had a narrow majority, and in 2009, when Democrats had a larger one. In those cases, the majority party could point to at least one major legislative accomplishment after the first six months in office. President George W. Bush, whose party controlled the House and Senate until Senator Jim Jeffords became an independent, signed a sweeping, $1.35 trillion tax cut in June 2001. Obama signed a $787 billion stimulus package in his first month in office, shortly after signing a $32.8 billion expansion for children’s health care. One key thing that’s currently missing is any leadership from the White House. Trump has rarely weighed in and made any public push for his legislative priorities. As the agenda item he promised over and over on the campaign trail — repeal of the Affordable Care Act — headed toward crucial votes in the Senate, he was consumed with criticism of Attorney General Jeff Sessions and with infighting among his top advisers. That’s hardly the discipline needed to push through an agenda. 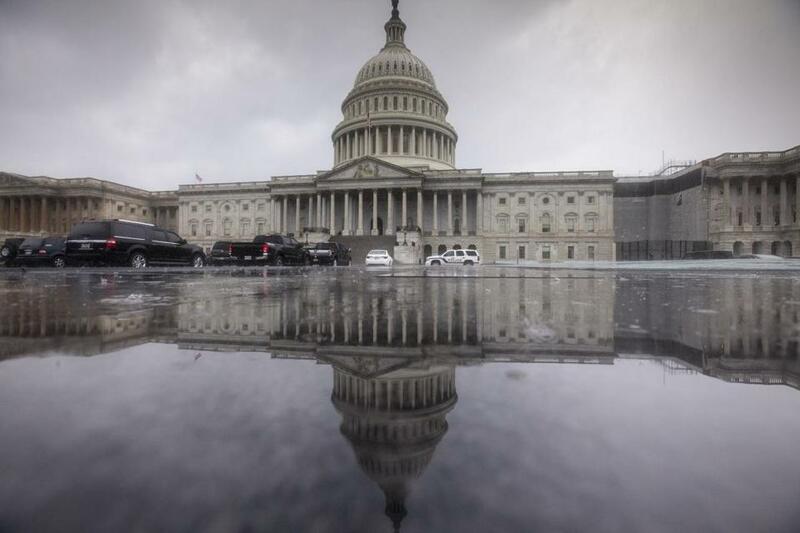 “It’s really hard to get big things done in Washington even when you have the most buttoned-down, disciplined administration focused like a laser and working hand in glove with Congress,” said Kevin Madden, a Republican consultant and former congressional staffer. Representative Charlie Dent, a Republican from Pennsylvania, told reporters on Friday morning that the president did not do enough to push the health care bill, failing to outline his core principles for a measure that would impact one-fifth of the US economy. This Congress has rolled back regulations and confirmed a Supreme Court nominee, but hasn’t gone much further. And while most Republicans have touted the confirmation of Supreme Court Justice Neil Gorsuch as a major accomplishment, it is hardly unprecedented: Obama saw his nominee, Sonia Sotomayor, and Clinton saw his, Ruth Bader Ginsburg, confirmed by August in their first year in office. Trump has pointed to the number of laws that he’s signed as a way to signal progress. “I will say that never has there been a president — with few exceptions; in the case of FDR, he had a major Depression to handle — who’s passed more legislation, who’s done more things than what we’ve done,” Trump told reporters in June. But that statement does not hold up. According to data through June 30, Trump and Clinton each had 43 bills enacted into law. Jimmy Carter had 58, while Lyndon Johnson had 63 and John F. Kennedy had 81. Dwight D. Eisenhower topped them all with 100. In some cases, the House right now is operating at a brisker pace while the Senate is only addressing routine nominees and passing laws that undo federal regulations implemented by the Obama administration. A senior GOP aide pointed to a series of bills passed by the House that have gone overshadowed — such as repealing Dodd-Frank financial legislation the week that former FBI director James Comey testified on his firing — or have not been addressed by the Senate. Democrats have not made it easy, particularly in the Senate, where they can force Republicans to take up time in passing even noncontroversial nominees. It’s a bit of payback for the way Republicans treated Obama’s nominees, dragging out both routine nominations as well as stalling on Supreme Court nominee Merrick Garland. But Trump is also woefully behind on even naming nominees to be considered. He had only nominated 952 nonmilitary nominees by June 30, and only 44 percent of those had been confirmed. That is by far the lowest number of nominees of any first-term president with a congressional majority since at least 1953. And most presidents had at least 90 percent of their nominees confirmed by this point. But Congress is about to face some major tests — not of whether it can pass sweeping legislation, but whether it can do some of the most basic functions required. The lawmakers need to fund the government and confirm more nominees. The debt ceiling needs to be increased. They have designs on achieving a tax code overhaul, as well as an infusion of more money into American infrastructure. But any hopes of using a health care repeal as a way to build momentum for other items on the agenda seems to have faded, even amid calls for some bipartisan solution and a pledge from Senate minority leader Chuck Schumer to work anew with Republicans. He then moved to begin taking up the National Defense Authorization Act, an annual defense spending bill. There had been a deal with Democrats that no one would object to move immediately to that issue, beginning Friday morning. But then Senator Rand Paul, using the power of one senator to stop action, objected. The Senate adjourned, with the issue put off at least until this week. Most senators left to return to their home states, another week without a signature accomplishment.